If you are wondering why I have been rather "quiet" for the past few days...well this is the reason. 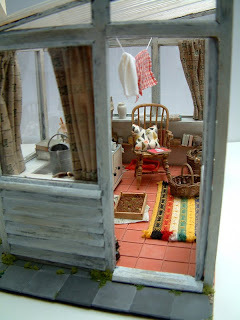 I have been working on a little project that will be shown as a "How To Make" project in the August Issue of Dolls House & Miniatures Scene magazine. 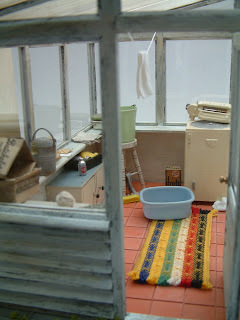 The 1950's of course is at least a whole decade on from the era of my more usual creations, although I do make an occasional 1950's item such as the 50's washing machine (yep...just had to include it in the utility room)! Showing my age now, but I remember as a very young child in the early 1960's, we actually still had an identical 50's cream washing machine with the mangle on the top. I remember being utterly fascinated as the handle was turned and the washing would emerge completely flat on the other side of the rollers! The mangle would be swung over so the drips of water would fall straight back into the tub. The lean-to itself was created by James Parker and instructions on how to make the construction was shown in the May issue of the magazine. My brief was basically to create the construction into a 1950's lean-to scene. Whilst researching for this project, I was fascinated to see from adverts in various vintage 1950's magazines, that lean-to's had a variety of uses such as greenhouse, conservatory as well as a utility room or porch. Hence, the reason why I chose to create two different uses ie. a utility room and a porch. The porch is meant to be a back porch where all kinds of clutter would often accumulate but some houses did have a lean-to as their front porch. For full details of this project, please see August Issue Of Dolls House & Miniatures Scene Magazine. I love it as it reminds me of the screened porches added to beach houses in South Carolina, and I am perpetually nostalgic for all the times I have spent at the beach! I love it. And I mean, I love it!